This keyboard is quite possibly our favorite among the more reasonably priced keyboards out there, and won our award for the best budget gaming keyboard for 2018. Though it has some expensive competitors with amazing features, the “bang for your buck” that you get with the HyperX Alloy Elite is more than worth it. The board has stunning design, with its red backlighting and amazing 18 LED light bar, clearly showing the designers value style as well as functionality. It also includes a soft palm rest for your hands, and dedicated media keys. The HyperX Alloy Elite features textured, titanium colored key caps for the most frequently used and important gaming keys, making them that much easier to locate. The framing is solid steel, making it incredibly durable and stable for any kind of gaming. The sturdy, solid keys make for an even more satisfying experience. The keyboard also comes with a mesh pouch for portability, and the bulky cable can be detached for easy carrying around. The keys can be easily replaced, if needed, and the various dedicated keycaps offered with this model are easily attachable. The keyboard comes in a variety of colors—including Cherry MX Red, Cherry MX Blue, and Cherry MX Brown—and its red backlighting is the star of the design, although it has very specific lighting settings. It has six lighting settings and four brightness modes. It is compact and solid, due to its steel frame. However, its full size is still small and compact enough that you can easily keep your mouse close by during gaming. Despite its heavy keys, it is not overly loud, so it is much easier to focus on the game. Above the main keys, there is a group of dedicated media buttons, new to this model. The keys make it far easier to navigate with this keyboard. Buttons for play, pause, skipping, mute, and volume are all visible due to this new feature, and all of them are just as sturdy as the rest of the board’s keys. The lighting bar mentioned earlier sits between the main keys and the dedicated media keys, and provide another beautiful design aspect of this great board. The lighting options are set by the manufacturer. Although there are only six, the elegance and ambience of the lighting bar make it more than worth the few options offered. The multitude of color options for the board—Cherry MX Red, Cherry MX Blue, and Cherry MX Brown—all make for different gaming experiences, but allow any gamer to feel a little more personalized in their choice of board. Many love the Red and Blue options for gaming, and each key color makes for a different sound experience as well as gaming experience. Those who choose the brown keys say that it is great for typing, though many prefer the other colors for gaming. However, overall the different colors make for a wonderful experience and let you feel a little more personalized in your choices. The main drawback of the design of the board is its massive cable, which is thickly braided. Its size makes it less flexible than other keyboards we reviewed in our best round up review for 2018, check it out here. There is also no wrist rest, though the board offers a palm rest for your hands. However, overall, the design of this board is solid and impressive. 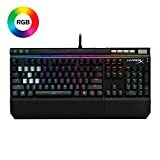 The various colored key options you have make your gaming experience that much more enjoyable—most people prefer the Cherry MX Red keys, as it really gets them in the spirit of gaming. The solid frame and the titanium dedicated keycaps for the relevant gaming keys make this board that much easier to navigate and use. Some gamers have mentioned a metallic sound if the keys are pressed rapidly, though in normal gaming the keys function well and the “sounds” of the keys only add to the gaming experience. The keys are also a bit closer together than on some other gaming boards, but its compact structure means that you can keep your gaming area tighter and neater for more controlled gameplay. The solid steel frame makes the board incredibly stable for any kind of gaming. Its keys are not too “mushy” and feel secure in their place for even those gamers who love to button mash. Its USB 2.0 makes it great for connectivity, and it even has a second USB if it is ever needed. The bulky cord that comes with the keyboard is detachable, making the solid keyboard easily portable and durable for transportation to tournaments, visits, vacations, or wherever you want to take it. Its smooth connection means there is no need for tedious installation software once the board is plugged in. Furthermore, the already cool backlighting and LED lights that come on the board have their own dedicated buttons right on the board, so you can easily cycle through the light settings and the brightness at any time. However, it would still be nice if there were more options for lighting. Overall, this keyboard is a great choice for any gamer. It’s solid and durable, but lightweight and easily transportable. It has detachable cords and multiple color choices, although we personally preferred the blue. Though some keyboards just above this price range might have more features, the price of this board is more than worth the features that it comes with. Its dedicated media keys and titanium, textured gaming keycaps make the board more efficient and user-friendly than a lot of boards on the market. Its great LED light bar and backlighting also make it one of the more stylish choices on the market. Out of the many keyboards out there, the HyperX Alloy Elite is definitely one of the best for the gamer who loves just that smallest hint of eye-catching style.